Coordination Chemistry Reviews, 2014, 270–271, 112–126. This review focuses on the synthesis, reactivity and structural chemistry of zinc hydroxides and oxides derived essentially from organozinc compounds. It demonstrates the advantages of the organometallic route to these classes of compounds that is time and atom efficient. We have surveyed the preparation of organozinc hydroxide complexes via direct hydrolysis of both R2Zn compounds and alkylzinc complexes of the type RZn(L) (where L = monoanionic, mono- or multidentate organic ligand). 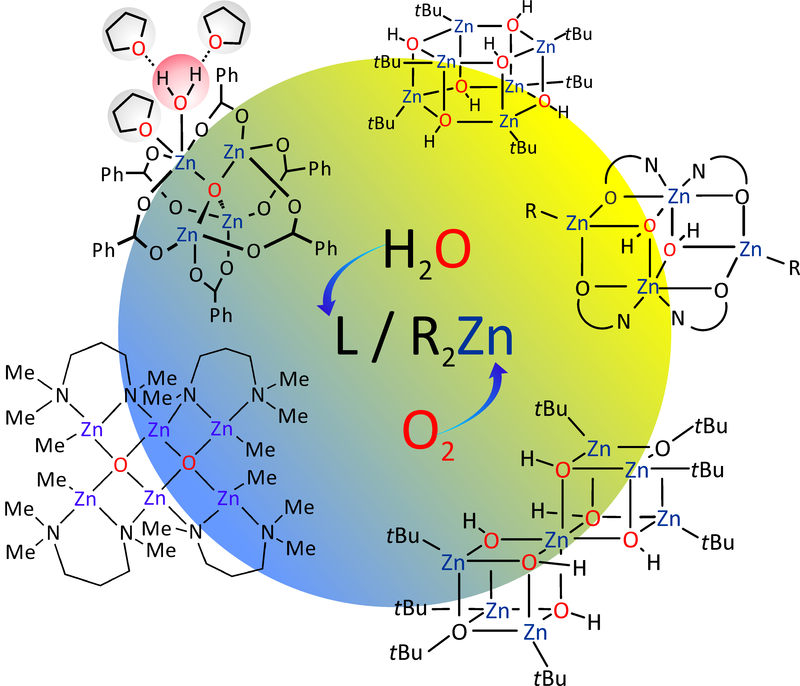 The variety of their molecular structures is discussed with an emphasis on how the character of zinc bonded alkyl substituents or L ligands can influence the stability and the mode of aggregation of the resulting zinc hydroxides. The section dedicated to synthetic procedures and the solid state structures of zinc oxides focuses on the following aspects: (i) zincoxane compounds; (ii) the encapsulation of ZnO species into organozinc moieties and (iii) zinc oxide complexes supported by organic ligands. Finally, utility of oxozinc carboxylates as a predesigned molecular platform for modelling of the reactivity of prototypical Zn-MOFs towards H2O and donor solvents is presented.